Nearly 40% of members wanted more outings, and this is already underway! A new Working Party, with responsibility for outings which will be widely available to members, has been created and has already met. The aim is for these branch-wide outings ("Open Outings") to be arranged regularly - ideally monthly. There's a new outings page on the website, where a whole variety of events will be on offer. In addition, where possible, outings arranged by specific study groups will be opened out to all members, too. 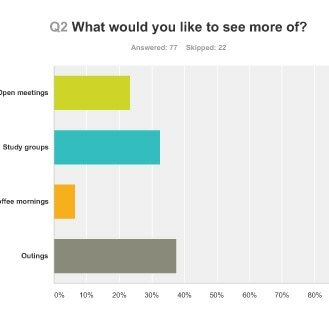 ​Study groups: 32% wanted more study groups and this was mentioned in comments too. But this can only happen if there are ideas from members and more offers to co-ordinate groups. There are already some groups waiting for group leaders - and there is help and advice available. Open Meetings: Whether these could/should be increased is under consideration. Open Meetings: Some people mentioned arrangements at Open Meetings could be better. The Committee is working on this, including microphone training, relaying questions to the speaker for all to hear, reserving seats at the back of the hall for latecomers to lessen disruption, and providing gluten free cakes. Some good ideas were also put forward to make new members feel more welcome. In future we will have identifiable 'welcomers' to meet and greet at OMs. Several people mentioned the need for more involvement from members - ‘individuals should be encouraged to put something in rather than be passive recipients’. So please if you have a skill, a good idea, have been to an interesting place others might enjoy, share your knowledge. Email westerhamU3A@hotmail.co.uk. 75% of members thought their membership fee was very good value. Furthermore, we have been able to keep subscriptions at the same level for 2017/18. - Members would like more information about study groups - we have fab new posters for OMs and will have enhanced information on the website soon. Many respondents made favourable comments and expressed satisfaction and thanks - something that the Committee, who are all volunteers, really appreciates. If you would like to read the full report, it is available here.